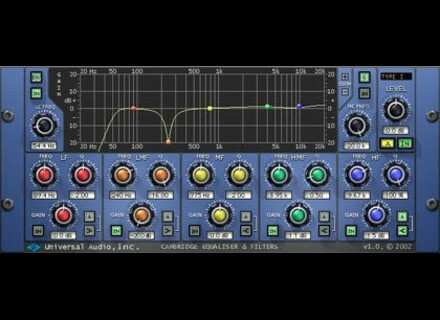 Cambridge EQ, Software parametric EQ from Universal Audio in the UAD Plug-In series. Universal Audio's Cambridge EQ is a software equalizer that can run in a variety of platforms. The EQ has five bands as well as high and low cut features. The process of installing the plug-in wasn't hard as I simply followed the basic steps that you normally would when installing a plug-in or another piece of software. I had the plug-in up and running in Pro Tools rather quickly and since have not had any issues with compatibility or otherwise with the software. The interface of the plug-in will seem familiar to experienced users, as I don't see anything too out of the ordinary here. Each of the five bands has parameters for frequency, Q (bandwidth), and gain. There are also knobs for high and low cut and for overall output level. Anything that you do is also reflected on a graph, which makes everything very easy to visualize and understand. I've never seen the manual for this plug-in, but it is easy enough to install and use that I don't think one is necessary. Rudy's's review (This content has been automatically translated from French)" My Number 1"
After 4 years of use, and many other plug test I have never been able to replace it is formidable precision. This is an eq that I use for "cleaning" of my tracks. Easy to use, filter effect carément acceptable. For an aesthetic Eq ago but I better not use it for that purpose. If I could keep a plug for this mix is ​​the one I take. No problem, easy to install and use. Intel DualCore + UAD-2 Solo. OS: Vista 32bit. All are stable. I use it for an ending for Anne. This is the best EQ I have used up Submitted. The slope break is awesome! The only problem as the price (purchase of a Universal Audio card plus the $ 150 it costs extra plugins). If your finances permit you I advise you not hsitation. APRS there are others trs also good for those who have not the budget.